A couple of years ago, David Post and David Johnson published an article at First Monday suggesting that it is right to think of virtual worlds as “places,” and discussing the legal ramifications of doing so. Because many more people are talking about virtual law now, and because developments since 2006 greatly inform the discussion, it seems a good time to revisit the topic. 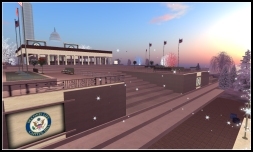 The idea of virtual worlds as “places” gives rise to a number of interesting legal possibilities, particularly the possibility of “local” governance. Post and Johnson make it clear that they are not claiming that these spaces necessarily should be viewed as sovereign states or that they should have their own legal regimes, but that is the clear implication of the questions raised here. Post and Johnson teamed up on a similar argument regarding the 2D internet in 1996. The themes here are the same, but the updated argument regarding virtual worlds makes more intuitive sense, because virtual worlds have more place-like attributes than the 2D internet. As a philosophy major, fiction writer, and Neal Stephenson fan, I find the argument appealing — as a litigator, however, I don’t think it is likely to gain much traction with judges or legislators. That’s because virtual world providers (particularly providers of social virtual worlds) have consistently and intentionally blurred the line between their “place” and the rest of the world; basically, they’ve removed the “borders.” They do this by offering real money trading and real cash economies. This creates opportunities for business (without which, arguably, most social virtual worlds would not even exist) but it also makes it rather difficult to conceptualize them as distinct “places.” As the line gets further blurred (for instance, by companies offering you the ability to order real life pizzas and clock radios using the virtual world client and currency) the borders will become even more indistinct. Since the “borders” are porous, and heading toward non-existent, I think that the argument that virtual worlds are distinct “places” that should be governed by internal laws will carry little credibility in real life legal proceedings. Notably, Post and Johnson do not take their argument all the way to this conclusion, but the argument represents the philosophy behind every defense of “it’s just a game,” so it is worth pointing out where the argument is likely to come apart. Post and Johnson ask: How often will users really turn to the courts, given the expense? Well, since the article was written, there have been a handful of real life lawsuits arising from virtual world activity. And as the dollars involved increase, I think the lawsuits will too. That said, Post and Johnson are right that the nature of many disputes arising from virtual world activity is such that pursuing the matter with a lawsuit isn’t viable. The money is too small, and even tracking down a real life person to sue is often not worth the expense. Post and Johnson argue that this implies that an in-world solution that treats this as a “place” is likely, and I agree, at least to the degree that something like eBay is a “place” that has developed internal rules and procedures. Notably, Second Life and other worlds do have internal rules and (albeit often flawed) reporting mechanisms for enforcement. This, in a sense, is only possible because it is a “place.” Users, of course, have also tried to implement various enforcement regimes in this “place,” by setting up shared ban lists and microgovernments with separate, typically stricter, rules and procedures. The article suggests it is conceptually helpful to think of virtual worlds as “places” in order to explain the existence of these tools, and with that, I also agree. Of course, it is not a prerequisite to having internal regulation in virtual worlds, even sophisticated internal legal systems, that those legal systems displace the physical-world/national legal systems: as I explain here, it is perfectly possible for in-world legal systems to run in parallel with existing legal systems. I think that’s likely the outcome here. What I picture in the long run is basically a first-option in-world alternative dispute resolution system. That will make a lot more sense when we’re using a world where at least the provider knows who most of the users actually are though. Until then, voluntary associations and compliance groups (e.g. Metaverse Republic, the CDS, various other microgovernments, etc.) are making some strides. there is an important conceptual distinction, which I highlight in the normative parallelism article to which I link above, between, on the one hand, alternative dispute resolution, and, on the other, a parallel legal system. An alternative dispute resolution system is simply a system for achieving compromises to claims that could have (and, invariably, would have) been brought in real-world courts but for the existence of that system. As such, ADR is entirely parasitic upon one specific, existing legal system. A parallel normative system (such as that under development by the Metaverse Republic is quite distinct: it is not about compromising claims that one might have in existing courts, but a legal system in its own right, with its own substantive (as well as procedural) law, and its own, independent means of enforcement. By contrast, the only way of enforcing rulings or agreements reached in ADR is by issuing proceedings in the ordinary national courts. A parallel system is not a second-rate substitute for ADR, nor some sort of stopgap: it is a preferable solution to using existing legal systems to resolve many types of disputes in virtual worlds. To be clear, it is entirely possible to have ADR systems within a parallel legal system: people may well set up arbitration and mediation schemes based on the law of the Metaverse Republic (indeed, we’d encourage it), and use the Metaverse Republic’s own enforcement mechanism to enforce the outcomes of those procedures. I see what you’re saying, Ashcroft. I’m sure I’ve visited that link before, but I’ll check it out again. In the meantime, how do you picture the Republic’s interaction with real life law? At the extreme end, the Metaverse Republic could, itself, always be sued, right? And if it was, it’d hardly be a defense that “Metaverse Republic” law applied. Which is why it seems like an ADR system to me, rather than a parallel legal system. the parallelism article answers that issue :-) As to the MR being sued, that presupposes that it will be treated in law as having legal personality: we have not yet finalised our arrangements, but it is quite possible that they will be such that the MR as a unit would not have legal personality, and one would instead have to bring suit against individual actors, if, improbably, there was ever a valid claim against the Republic.